Home › Market News › Research & Analysis › Bitcoin…Fools Gold? 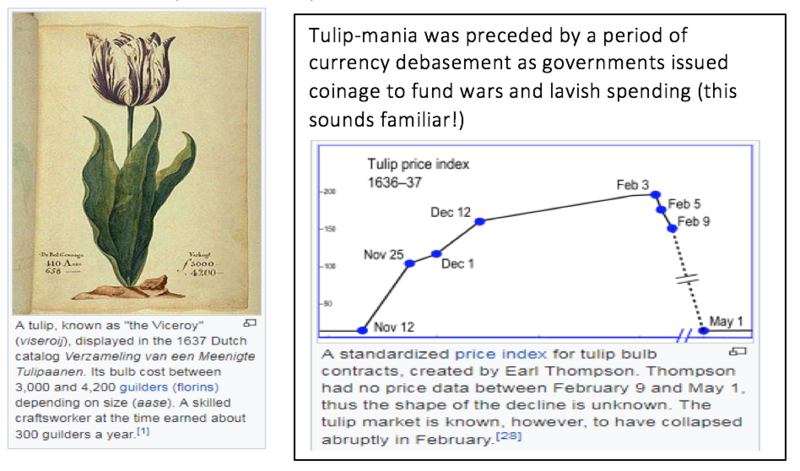 Most investors are familiar with “Tulip-mania”, the first detailed speculative bubble that ended in collapse in February 1637. “Extraordinary Popular Delusions and the Madness of Crowds” by Charles Mackay in 1841 is a detailed account of Tulip-mania. Its thesis was the Dutch public engaged in an irrational speculative frenzy. Investors are meant to be rational when making investment decisions. But behavioural finance also holds that investors can be irrational on rare occasions. This is tacit recognition that “bubbles” can occur. The above graph is special, it is the first time plot of a “bubble” i.e. a period when the price inflates and moves away from fair value before eventually deflating spectacularly. The “Sempre Augustus Tulip” price returned to fair value on May 1st 1637 after a period of 169 days. So far 2017 has seen a multi-billion dollar popular frenzy over “Bitcoin”. “Bitcoin” was the first cryto-currency. It is not a currency in a traditional sense of a promise to pay issued by a central bank. There are a fixed 21m bitcoins in issue. We are told no more can be issued. It is an unregulated evolving “ledger currency” that can be used for some online transactions. Is the Bitcoin phenomenon a function of quantitative easing and a loss of confidence in central bank policy? Zero interest rates? Is it a global investing public getting excited about crypto currency as a new investment class? Is it primary function for settlement for criminal activity/ money laundering? 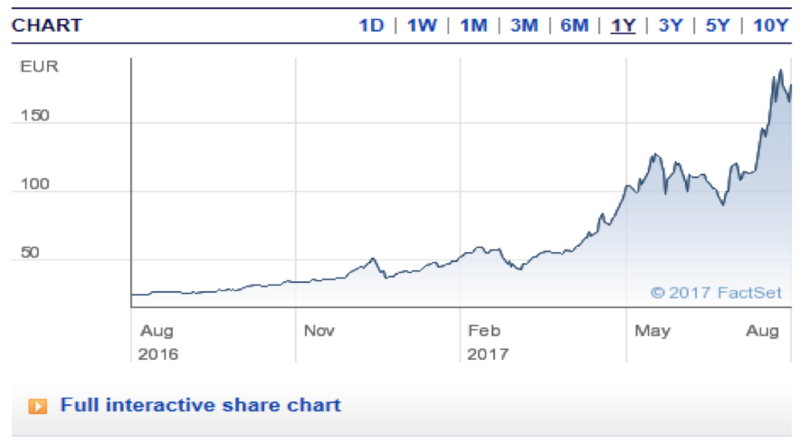 Is it a bubble? Is it a composite of all these things? Many questions, but few answers. Central banks are now coming forward with answers. On 5th September 2017, the Chinese government banned initial coin offerings – the People’s Bank of China ruled the unregulated sales of crypto-currencies via “ICOs” (“initial coin offerings”) violated Chinese securities laws and must stop immediately. This reflected concerns in the Far East that the technology essentially amounted to a “pyramid scheme”. The central bank was thought to be concerned also that the proliferation of these ICOs were scams aimed at the gullible investing public. The move hit Bitcoin hard, its price fell from $5,000 to as low as $4,000 a 20% decline in three days. The drop was compounded by a statement from the socialite Paris Hilton that she was investing in an ICO! Investment vehicles purporting to invest in crypto-currencies have attracted the full gamut of “boiler room scams”, i.e. unregulated firms containing salespeople ringing up offering “carbon credits”, plots of land without planning permission, binary options to retail investors. This crowd has moved onto crypto-currencies. The Telegraph (11th August 2017) reported that the police had shut down a fraudulent cryto-currency business in the City of London after it was found cold calling investors and attempting to sell them fake online money. The recent “Wanna Cry”cyber-attack on the UK NHS IT systems and the hackers’ demand for Bitcoin ransom payments is clear evidence of the appeal to the criminal underworld. BTC-e a major exchange that was closed in July 2017 has been accused of laundering $4bn in Bitcoin since its launch in 2011. Despite the bad press there appears to be little oversight and management behind Bitcoin. If you print your own money, that is a crime. But who precisely ensures the Bitcoin is not manipulated by the wrong people? 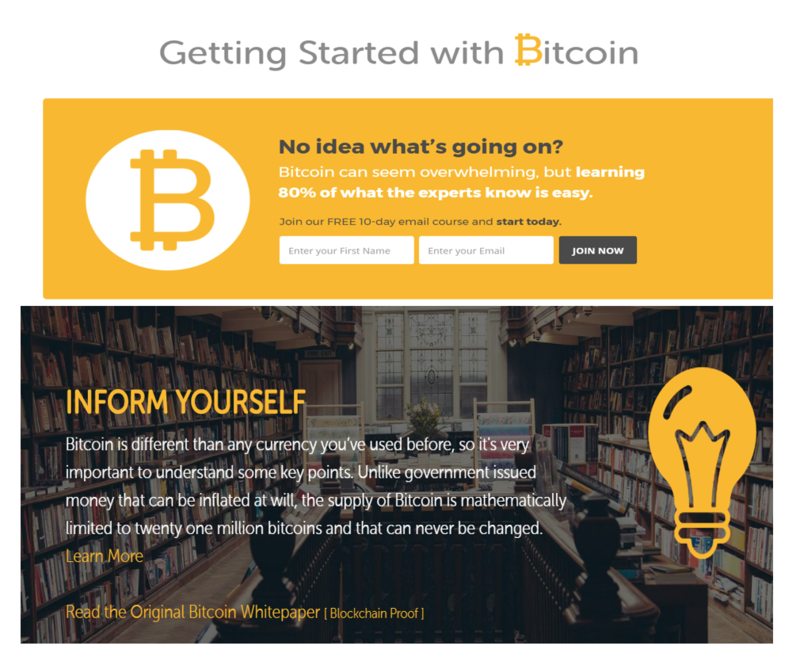 The first port of call is a visit to the Bitcoin website. This is at https://bitcoin.com. The image below is the on home page. The Bitcoin website says only 21m Bitcoins exist. This major point is the peg on which the Bitcoin coat hangs. Purchasers are relying on this as proof that it is not subject to normal money supply factors. We are led to assume the bitcoin cannot be inflated away. Sometimes you must suspend both disbelief and critical faculties. Assuming you can afford it, it is okay to gamble on Bitcoin, the important thing is to know you are gambling. With this state of mind you accept the investment is 100% at risk. I am not going to get into the rights and wrongs of Bitcoin, its history, its potential trajectory. It does appear to exhibit some “bubble” traits but whether or not it is, is not a “bubble” we will only know after a price collapse. Due to its nature as a crypto currency (it can be used for blockchain type transactions) it would be wrong in our view to “recommend” Bitcoin. All we will venture is How to invest in Bitcoin….we maintain the desirability of doing so is a decision for the investor. We also suggest visiting www.cryptocompare.com for more detail on Bitcoin and other crypto-currencies. XBT PROVIDER AB is a Swedish company (Sweden domiciled) offering a “Bitcoin” tracker fund that is structured as a Euro (€) demoninated exchange traded note (ETN). Launched in May 2015 the ETN can be held in SIPP and normal trading accounts. The note is structured as a normal synthetic trading instrument, i.e. it is bought and sold on the OMX Stockholm exchange as an exchange traded fund. Each note represents a 5% stake in 1 Bitcoin. The note can be traded on numerous online platforms with a low spread. The ETN structure is transparent and represented by a specific number of Bitcoins. There is no leverage in the ETN structure. The main advantage of using this ETN is the ability to invest smaller amount than the US$4300 odd price of 1 Bitcoin – it allows the ability to invest in far smaller amounts. This “investment” cannot be approached from the standpoint of conventional investment analysis. It is entirely in the eye of the beholder. My view is retail investors should stay away from unregulated crypto-currencies in general as these remain in an evolutionary state and there are simply too many unknowns.